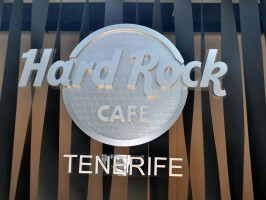 Hard Rock Cafe Tenerife is located on Playa De Las Americas, the main street through the city, and is housed in one of the biggest buildings on the island. Surrounded by shopping and leisure activities, the Cafe is the highlight of everyone's day, local and tourist alike. 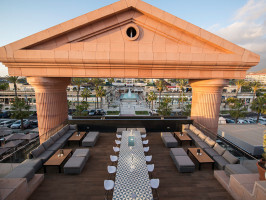 Appointed with modern, and very cool, decorative flare and that world-renowned Hard Rock style, the Cafe features 2 floors of dining and relaxing, 2 function rooms for all your group needs, and 2 terraces looking out over the beauty of the city. 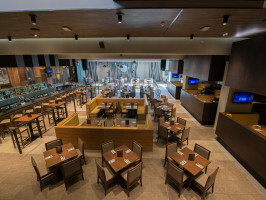 With more than 100 pieces of memorabilia, Hard Rock Cafe Tenerife feels very familiar, at the very same time you realize you are in one of most incredible venues on the planet. 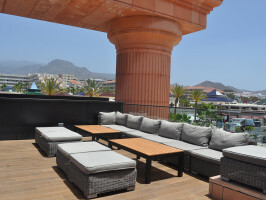 It's time to experience Hard Rock Tenerife for yourself! We'll see you soon. Menus are available daily from midday to 5pm only and customers who show our ticket have preference to have the first table available. Basted with hickory barbecue sauce and topped with caramelized onions, cheddar cheese, smoked bacon, crisp lettuce and vine-ripened tomatoes. Romaine lettuce tossed in our homemade Caesar dressing, topped with garlic croutons and shaved Parmesan cheese. Toasted sourdough bread layered with rich mayonnaise, iceberg lettuce, vine-ripened tomatoes, smoky bacon and thinly sliced grilled chicken. Our Hard Rock signature ice cream: chocolate or vanilla. A soft drink, water, beer or wine. Cavatappi macaroni tossed in a three-cheese sauce with roasted red peppers, topped with Parmesan parsley bread crumbs and grilled chicken breast. Famous the world over. Topped with seasoned bacon, two slices of cheddar cheese, a crisp fried onion ring, lettuce, tomato and day pickles. Half chicken, basted with our hickory barbecue sauce and roasted until fork-tender. HRC ICE CREAM Our Hard Rock signature ice cream: chocolate or vanilla. Crispy potato skins filled with our homemade cheese sauce, smoked bacon and spring onions. Served with a side of sour cream. Fall-off-the-bone tender St. Louis-style ribs, rubbed with our signature seasonings and basted with hickory barbecue sauce. 8-oz filet, wrapped in cedar paper, grilled tender and drizzled with sweet and spicy barbecue sauce. Served with Yukon Gold mashed potatoes and seasonal veggie. Famous the world over. Topped with seasoned bacon, two slices of cheddar cheese, a crisp fried onion ring, lettuce, tomatoes and day pickles. Hand-breaded, lightly fried tenderloins of chicken, served with honey mustard and hickory barbecue sauce. Choice of: Hamburger, Hot Dog or Tomato Pasta served with fries. The restaurant is open Sunday to Thursday, from midday to 12.30am and Friday and Saturday from midday to 1.30am. The bar is open Sunday to Thursday, from midday to 2am and Fridays and Saturdays from midday to 3am. 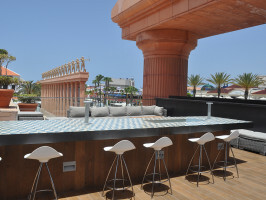 Meeting point: Avenida De Las Americas S / N. Pyramid Of Arona. Opening time : The restaurant is open from Sunday to Thursday, from 12:00 to 00.30 hrs Friday and Saturday from 12:00 hrs - 1.30 am. The bar is open from Sunday to Thursday from 12:00 to 2:00 a.m. in the morning and on Fridays and Saturdays 12:00 a.m. to 3 a.m. in the morning.